If you have always wanted to straighten your front teeth, but you just don't want to have it take years of your life, Six Month Smiles orthodontics from certified provider Dr. Charles Briscoe might be exactly the solution that you need. It's a shame, but many adults are so self-conscious about having crooked front teeth that they are afraid to smile. If you are someone who has always wanted to have straight teeth, but don't want to wear metal braces for years, a Six Month Smiles consultation with Dr. Briscoe may be just right for you. The Six Month Smiles system uses less noticeable clear braces to gently straighten and align teeth in an average time of just six months. Focusing just on the teeth that show when you smile, this system is made up of braces and wires that are colorless and blend in with your teeth. As a result, they are virtually undetectable so you can get on with your life while your teeth are being straightened. Even more, this innovative, convenient orthodontic option is available right here through Dr. Briscoe, whose patients say he delivers the best results with Six Month Smiles San Diego has to offer! You will have a shorter treatment time with Six Month Smiles from La Jolla Dental Care because these clear braces only straighten your teeth that show when you smile. It's a revolutionary cosmetic-focused treatment designed to correct the things that bother you the most about your smile. In comparison, traditional metal braces work to align not just your front teeth, but your entire bite. The average treatment time is 2 to 3 years, or 4 to 6 times longer. Clear plastic aligners, such as Invisalign, typically take 12 to 18 months. Because they are removable, length of treatment can be further prolonged depending on the user. typically cost 20-30% less than metal braces or plastic aligners. 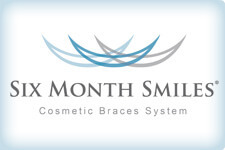 Six Month Smiles braces are nearly invisible, and the special nickel titanium wires used are tooth-colored as well. As a result, your braces will hardly show in casual conversation. You will probably have to point your braces out to your friends if you want them to notice! Six Month Smiles won't correct serious bite alignment problems, but, like traditional braces, they can be used by almost every adult, age 15 or older. They will predictably straighten the teeth that they are intended to straighten: those that everyone sees when you smile. In contrast, clear aligner therapy only works for certain types of cases. And the results are not as predictable, sometimes requiring months in metal braces at the end of treatment to finish the treatment to the desired result. How do you know if Six Month Smiles is right for you? In a Consultation, Dr. Briscoe will help you decide if Six Month Smiles should be part of your Smile Makeover. The best way to find out if you are a candidate for Six Month Smiles is to schedule a consultation with Dr. Briscoe in his La Jolla dental spa. In a consultation, you can ask all of your questions, and find out how we can provide you with the finest results with Six Month Smiles San Diego has available.